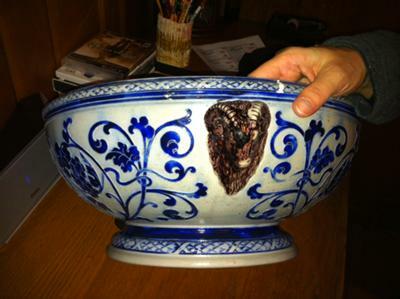 Looking for help in identifying this large antique stoneware bowl. It is very large measuring about 12-14 inches across. It is definitely stoneware with blue glazed scrolled grapevine type raised design with purplish or blue glazed rams heads on either side of bowl. I don’t know anything more about it. The antique stoneware bowl has a makers mark of a triangle with the letters A (at top, inside) S (left inside) and F (right inside). 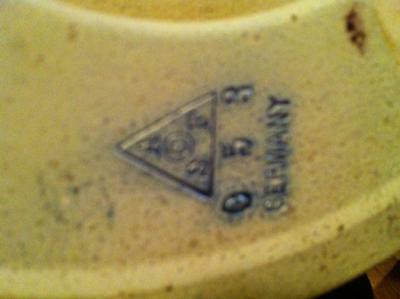 It also has the numbers 053 directly under triangle and the word GERMANY is under that. I would appreciate any help or assistance anyone can offer.